Earn up to 5,592 reward points. Professional four-processor access to UAD Powered Plug-Ins - for MacBooks, iMacs, and Windows 7 PCs. The UAD-2 Satellite QUAD Core is Universal Audio's most powerful FireWire DSP accelerator, giving producers and engineers full access to award-winning UAD Powered Plug-Ins on Intel-based Macs and Windows 7 PCs*. In creating UAD plug-ins, UA's DSP engineers work with the original hardware manufacturers - using their exact schematics, golden units, and experienced ears - to create fully authenticated plug-ins with all the warmth and harmonics of classic analog equipment. Powered by four SHARC processors, the UAD-2 Satellite QUAD Core easily connects to Intel-based Macs and Windows 7 PCs* via FireWire 800, letting you run large, complex mixes, without taxing your host computer. Additionally, you can connect to Thunderbolt-equipped Macs via Apple's Thunderbolt-to-FireWire adapter. The UAD-2 Satellite QUAD Core includes UA's "Analog Classics" plug-in bundle, and provides access to popular UAD plug-in titles from Ampex, Manley, Lexicon, EMT, Empirical Labs, Neve, Roland, Fairchild, Harrison, Little Labs, Studer, SSL, and more (sold separately). 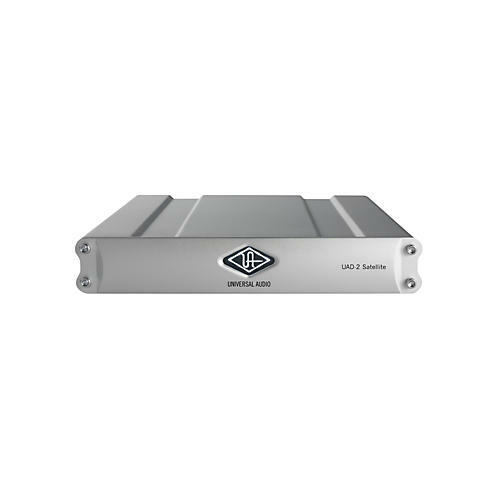 With support for VST, Audio Units, RTAS, and full 64-bit operation, the UAD-2 Satellite QUAD Core is easy to use. Just install the software, connect the unit to an available FireWire 800 port, power up and start mixing with some of the world's finest audio plug-ins. * Requires Windows 7 64-bit edition operating system and a qualified PCIe-to-FireWire adapter. Take the power of the UAD-2 Satellite QUAD Core with you wherever you go.